But wait! You can actually customize the gestures! 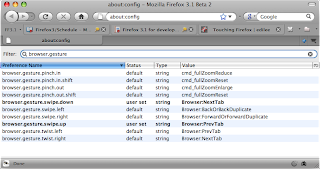 To do so, enter "about:config" on the location bar to open the advanced Firefox configuration page. Don't be scared by the list - now enter "browser.gesture" in the Filter field, and only the list of gestures will be shown. For example, if you like to rest your fingers on the trackpad (like me), you may find it annoying to trigger the swipe up/down gestures by accident. But no worry - you can map it to something else, or disable it completely. I changed them to "Browser:PrevTab" and "Browser:NextTab" so that my swipe up/down is now previous/next tab. Keep in mind that these gestures are experimental and may change when Firefox 3.1 is officially released. We'll keep you informed!